(Alliances: At the end of the 19th century, relationships between European countries were often fragile, mistrustful and based on fear. They all began to seek alliances with other nations who might help them if conflict arose. Great Britain: an industrial powerhouse with colonies all over the world; small island nation; powerful navy to protect alliances; gave the country potential to be powerful when necessary. Germany: a powerful industrial giant; building army; and alliances. These two nations would become the leaders of the alliance system in the years leading up to 1914 and the beginning of the war. Balance of power is the term used to describe a political relationship between countries. Like a set of scales. The relationship between countries is delicately balanced, but either side can move up or down as political, economic and cultural events unfold. Foreign diplomacy: Form treaties, agreements, military pacts, and economic and trade ventures. Keep balance of power. Leading into the 20th century, attempts to maintain the balance of power and avoid conflict resulted in the establishment of covert (secret) and overt (not secret) military alliances. The result was just the opposite of what was intended: the balance of power became very delicate and likely to fall apart. Nationalism: – pride in one’s nation, ethnic nationalism, linguistic nationalism and separatist movements are only some of the many forms of nationalism. The Ottoman Empire (also known as the Turkish Empire, or Turkey) lasted from 1299 to 1923. It was the eastern area of the ancient world ruled by Sultans. During the 19th century, nationalism played a key role in its downfall. Nationalism weakened the Ottoman Empire as the Slavic peoples of the Balkan region struggled to free themselves from Ottoman control. The Austrian-Hungarian Empire (also called the Austro-Hungarian Empire) was also disintegrating. Serbia declared independence in 1878 by allying itself with Russia, only to be taken over by the Austrian-Hungarian Empire in 1908. Serbia wanted to unite with Bosnia and Herzegovina, also controlled by Austria-Hungary, to form an independent nation of Slavic people. The Balkan Wars 1912-13The Ottoman Empire (Turkey) continued to grow weaker when, in 1912, Serbia, Greece and Bulgaria (calling themselves the Balkan League) attacked Turkey and captured almost all the remaining Turkish land in Europe. Sir Edward Grey, the British Foreign Secretary, arranged a peace conference in London. In 1913, the Bulgarians, unhappy with their share of land captured from Turkey, attacked Serbia and were defeated. Britain and Germany used their influence to bring the war to an end with the Treaty of Bucharest in 1913. As a result of the Balkan wars, Serbia proved itself to be the most powerful Balkan state and felt confident enough to threaten Austria, and Germany mistook Britain's cooperation as a sign of weakness. The "spark" that actually started World War I was an assassination in the Bosnian capital city of Sarajevo. At that time, Bosnia was a part of the Austrian-Hungarian Empire. Many Slavs lived in the Balkans. Pan-Slav nationalist groups wanted to end Austro-Hungarian rule and bring the Slavs of the area together under the rule of Russia. On June 28, 1914, the Archduke Franz Ferdinand and his wife were on an official visit to Bosnia. The Archduke was next in line for the throne of Austria-Hungary. Click here to view a film clip of their arrival at Sarajevo's town hall. Gavrilo Princip, a member of the Serbian terrorist organization known as the Black Hand, killed both the Archduke and his pregnant wife shortly after they left the town hall. Following the assassination, Austria-Hungary sent an ultimatum to Serbia, where the Black Hand terrorists came from. Austria-Hungary demanded justice for the assassination and wanted Serbia to control its terrorists. More importantly, it wanted to stop Serbia from being a centre for the Pan-Slav nationalist movement that sought to end Austro-Hungarian rule over Slavs. The demands were unacceptable to Serbia. Austria-Hungary expected that they would fight a local war, put an end to the nationalist uprising in Serbia, and return to normalcy. They never expected the Serbians to ask for help from Russia (one of its allies), and receive it. Russia supported Serbia and readied their military for war. This set off a domino effect, and what was supposed to be a regional conflict quickly turned into a global war. When Russia began mobilizing its troops, the complex network of military alliances and secret deals came into play. The complex web of alliances obligated other countries to mobilize as well. One nation after another prepared their armies, and plans for mobilization quickly became plans for war. Germany and Austria-Hungary launched an attack on France, Russia and Serbia. Great Britain wanted to remain neutral but couldn't stand by after neutral Belgium was invaded by the Germans on their way to France. This brought Great Britain and her colonies into the war, along with Japan (another ally of Great Britain). When war was declared on Germany, Turkey entered the war as an ally of Germany. The "war to end all wars" had begun, setting in motion an event that would kill millions of soldiers and civilians. 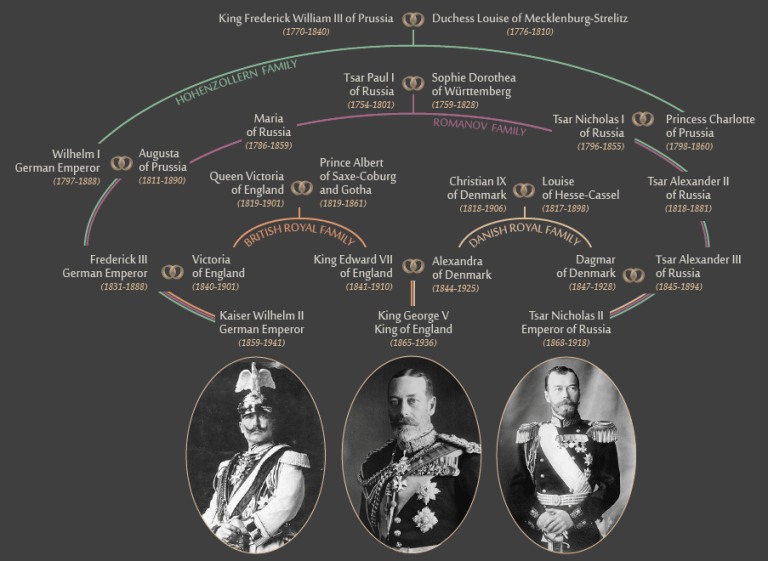 Kaiser Wilhelm II and Tsar Nicholas II were third cousins and the Kaiser was a first cousin of Nicholas's wife. The two leaders called each other "Willy" and "Nicky" informally, and although their formal communications used their formal names, their correspondence on the eve of the war has become known as the Willy-Nicky telegrams. The telegrams start with a plea from the Tsar to the Kaiser, as an old friend, to help him try to avoid a European war. As the telegrams continue, they show that the leaders began to realize that factors out of their control were pushing their countries toward mobilization. Nonetheless, they maintained their belief that mobilization did not necessarily mean war. Unfortunately for them, it did mean war between their nations and that of King George V of England, who was first cousin to both Wilhelm (on his paternal side) and Nicholas (on his maternal side). It was too late to turn back. War had begun.